The comedian and Radio X DJ has spoken about the grunge icon and male suicide in his latest Trews episode. 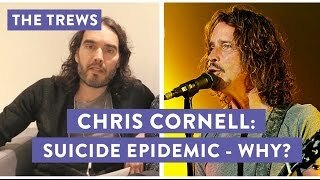 Russell Brand has dedicated an episode of the Trews to male suicide and the tragic death of Chris Cornell, who took his own life on Wednesday (17 May). In his YouTube video with Dr. Brad Evans, he said: "I know he's a man that struggled with alcoholism and addiction, and whilst I believe he was clean at his death, I suppose it's from a personal perspective that I look at it". He added: "I'm always concerned when there is a suicide from someone like Chris Cornell's a person that lived I imagine a fulfilling life, a successful life. "So, what does it say about success in those terms if it still delivers ultimately that conclusion?."